As the Recovery Audit Contractor program stages its opening offensive, here are 10 best practice steps for protecting your organization’s interests. No more delays. As a recent challenge to the award of the Recovery Audit Contractor (RAC) contracts was settled in early February, the healthcare community watched as the Centers for Medicare & Medicaid Services (CMS) simultaneously lifted the stop work order and once again began officially moving forward with the program’s implementation. The CMS’ aggressive answer to fighting fraud, abuse, and waste in Medicare, the RAC program was catapulted from a demonstration project to a full-fledged, permanent fixture last year, creating urgency in the industry for healthcare organizations to protect themselves from revenue losses associated with retrospective denials. The demonstration project, which was implemented in New York, Massachusetts, Florida, South Carolina, and California, ended in March 2008 and proved successful in locating and correcting more than $1 billion in improper Medicare payments, of which 96% were for overpayments collected from providers. With the contract dispute settled, industry professionals suggest that organizations get strategies in place to deal with the government initiative. Some in the know suggest a two-pronged approach that is both reactive and proactive. Industry experts mention 10 steps—some reactive, others proactive—that prudent healthcare organizations can take to get themselves better prepared to handle the rigors of RAC audits. 1. Establish a RAC steering committee: Cahalan says it’s imperative to have a team in place that is devised as “leadership from the top” to develop a response plan to regularly review the status of RAC requests. “These are the people who will make sure that there is accountability and things are getting done,” she says, adding that the team should be multidisciplinary in nature and feature input from coding, case management, and any other levels of an organization pertinent to the denial process. “We find that most organizations have a weak denial management process,” she says. 2. Be prepared to add staff or shift duties: Lou Ann Schraffenberger, MBA, RHIA, CCS, CCS-P, manager of clinical data with the Center for Health Information Services at Illinois-based Advocate Health Care, explains that it was obvious to her group that the RAC program would require at least one additional full-time employee: a RAC coordinator. Schraffenberger says Advocate Health Care, which encompasses nine acute care hospitals, four medical clinics, and two children’s hospitals, realizes it may have to hire additional staff once it has a better idea of the workload. “We just don’t know quite what to expect,” she says, noting that the organization is currently treading cautiously. In her experience, Stanton, who also recommends that larger healthcare systems hire a dedicated RAC coordinator, found that some entities participating in the demonstration period needed as many as six new staff members. When realigning responsibilities, Cahalan cites the importance of identifying a contact person. “I think it’s a good idea to have one person manage all information back out to RAC,” she suggests, adding that such a move would create less confusion. 3. Make friends in the mail room: Stanton notes that organizations should first and foremost make every effort to avoid technical denials because that will be a total loss of a claim as opposed to the smaller amounts associated with coding or documentation errors. On a smaller scale, there are fundamental procedures that need to be addressed. For example, “If you don’t get the [RAC] letter in a timely manner, RAC doesn’t really care,” she points out, adding that healthcare organizations have 45 days to respond. Stanton suggests keeping the envelopes for postmark verification. During the demonstration period, she says RAC would sometimes date a letter but then not get it in the mail for a couple of weeks. By producing the postmarked envelope, healthcare organizations can then request an extension. Alongside the filing of envelopes and correspondence, Stanton also suggests that organizations scan all correspondence and keep it in a network file that can be interfaced with a RAC tracking system. 4. Invest in technology: Experts agree that technology and automation will be key components to successful RAC management. Stanton says there is a wide range of software on the market with various complexities and prices. “There seems to be something for everyone,” she notes. The technology strategy is still being worked out at Advocate Health Care, according to Schraffenberger. “We definitely recognize the need. They have looked at some vendors, but no decision has been made. There’s some thought that we could build our own,” she says. 5. 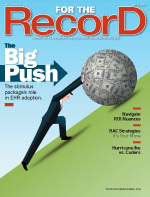 Have a hybrid record strategy: Industry experts warn that organizations working in a hybrid record environment, where some parts of the patient record are electronic and others are paper based, will face more challenges. 6. Make haste, not waste: In an age when resources and time are always coveted items in healthcare organizations, it’s important to build them into any RAC strategy. Offering an example of how providers should weigh these types of considerations, Cahalan points to choices such as whether it’s a good use of time to review claims before sending them to RACs. “I don’t think it’s a bad choice to just send,” she says, pointing to the fact that information can’t be changed or altered anyway. Another consideration that organizations will have to chew on revolves around the decision to appeal every denial. 7. Assess vulnerabilities: One advantage to adding staff is that some of their time can be allocated to locating vulnerabilities, as well as establishing benchmarking strategies for going forward, says Stanton. Pointing out that RACs are required to pull records that either have a high probability of error or where the existence of an error is certain, Stanton says most organizations should have an idea of where to look for vulnerabilities. 8. Concurrent documentation programs: All roads lead to the need for greater specificity in documentation, and Cahalan points to concurrent documentation programs as a viable option for organizations that want to get up to speed. According to industry insiders, many clinical documentation improvement programs nationwide are trending toward the concurrent option, an approach that essentially provides clarification to documentation issues while a patient is still in a healthcare organization’s system instead of weeks later. In this set-up, dedicated staff audit the previous day’s charts, obtain physician feedback when questions arise, and perform follow-ups on issues from previous days. 9. Build physician buy-in: Because so much of the documentation process comes down to the quality of data provided by physicians, Schraffenberger says organizations should not negate the role that medical staff play in the RAC process, especially when it comes to proving medical necessity. To achieve the desired level of documentation, it comes down to ongoing education and dialogue, she says. 10. Consider self-reporting: Stanton points out that there exists an option that helps eliminate RAC worries before they even begin: self-reporting. If an organization uncovers obvious errors that will result in the denials, it can self-report the error. Under those conditions, a RAC is unauthorized to review the claim any further. Under the program, the four RACs will contract with subcontractors to supplement their efforts. PRG-Schultz, Inc will serve as a subcontractor to HDI, DCS, and CGI in regions A, B, and D. Viant Payment Systems, Inc will serve as a subcontractor to Connolly Consulting in region C. Each subcontractor has negotiated different responsibilities in each region, including some claim review. Additional states will be added to each RAC region later this year.